There are many skin conditions people suffer from that can cause irritation and discomfort, such as Eczema around the eyes. Eczema affects many people and it is a condition that can cause skin discomfort. This condition can be treated with medications that will alleviate the symptoms associated with it. There are several causes for Eczema, and it can affect different areas of the body. This article will help you find a natural remedy, so you can cut out or reduce the use of medications that may have negative side effects. 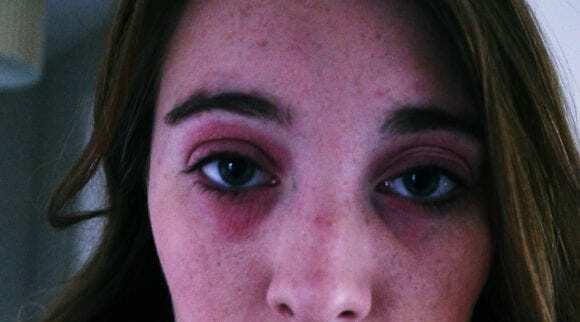 If you’re searching for an eczema around the eyes natural remedy, first you need to know what eczema is and why you may have it. Eczema is a condition that many people suffer from but there may be some who are unaware of what it is. According to the Mayo Clinic, Eczema or atopic dermatitis is a skin condition that can cause skin to feel red and itchy. The itchy feeling caused by eczema makes it a condition that can be uncomfortable to deal with. This condition is most common among children, but it can affect older people. It is also a condition that can occur along with other conditions such as asthma or hay fever. It is a chronic condition that can flare up occasionally and there have been no cures found for it. Eczema is a condition that people may have to deal with throughout their lives, so it is important to find ways to treat it. Fortunately, there are many treatments and self-care measures that can be used to relieve the itchy feeling and can prevent new outbreaks. This allows people to manage the discomfort caused by eczema and future outbreaks. It can be important for people who suffer from eczema to be aware of every possible treatment that will help them feel more comfortable. There are several symptoms of eczema that can vary from person to person. Being aware of the symptoms can help someone identify whether they have this condition or not. The symptoms include dry skin, itchy skin, red to brownish-gray patches, small bumps, thickened or cracked scaly skin, raw or sensitive skin, and swollen skin. The red to brownish gray-patches can be located in several areas of the body such as hands, feet, ankles, wrists, eyelids, etc. Finding patches of skin in these areas of your body that have the red or brown color can help you identify if you have eczema. There are a few causes for eczema that are important for you to consider so that you may avoid them. Your healthy skin has the ability to keep in moisture that can help prevent you from being affected by bacteria, irritants, and allergens. Eczema is similar to a gene variation that can affect your skin’s ability to stay moisturized and protected. This is what can cause your skin to be affected by environmental factors and can cause your skin to feel irritated. Food allergies are also another possible factor that can cause eczema. Eczema may require medical attention if it affects your sleep or daily activities, if you develop a skin infection, or if your symptoms continue while using home remedies. Children may need immediate medical attention if the affected skin is infected or if they have a fever. Both of these facts show that eczema can develop into a more serious condition, which is why it is important to find a treatment. Finding a treatment to eczema can help prevent your condition from getting worse and avoid a doctor visit. Treatments can come in the form of medications or natural remedies, so you can choose the one you prefer. One of the areas of your body that can be affected by eczema is the area around your eyes. Thankfully, there are several natural remedies that can help prevent it. One way to make your skin irritated is to rub your skin too much when you are drying yourself off after a bath or shower. Therefore, one natural remedy is to make sure you dry yourself off gently and carefully (Mayo Clinic). In addition, make sure you do not dry yourself completely so that your skin is just a little damp. Then, you can put moisturizer on the skin around your eyes. This can help alleviate irritated skin and prevent your skin from becoming even more irritated. There are products that can help you dry yourself off without irritation, such as certain towels. Certain soaps can cause eczema breakouts or worsen the condition of already irritated skin. One possible natural remedy is to use mild soaps or cleansers to wash the skin around your eyes. There are some soaps such as deodorant soap or antibacterial soap that get rid of the natural oils on your skin, which you don’t want. 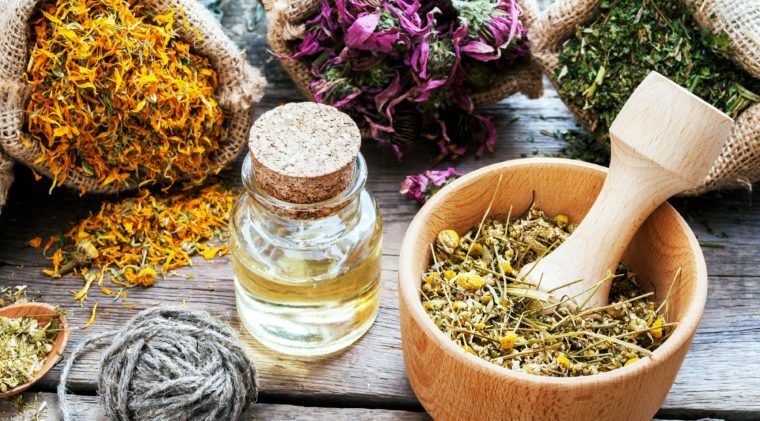 Removing these natural oils can cause your skin to dry out and can make your eczema condition worse. There are many different soaps you can choose that can help keep your skin moisturized, so you can avoid irritated skin caused by eczema. 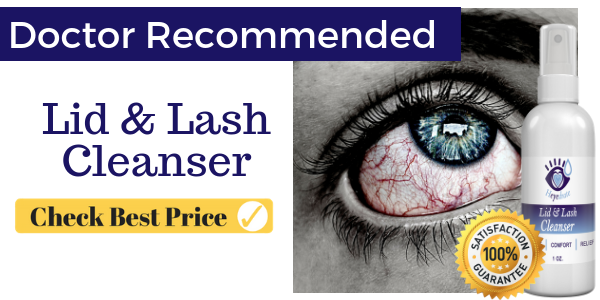 The cleanser we recommend is Heyedrate Lid and Lash Cleanser, which is a spray solution that is easy to use and very effective for maintaining healthy, clean eyelids. Another natural remedy is identifying possible triggers that can cause an eczema breakout. The goal being to avoid those triggers. Triggers for eczema can include skin reactions to sweat, stress, soaps, dust, pollen, and much more. You can figure out what triggers your eczema breakout so that you can reduce your exposure to them. Eating certain foods can also be a trigger, which can be allergies caused by certain foods. There may be products that you can buy to help you avoid possible triggers for your eczema breakouts or symptoms. One way to help prevent eczema breakouts or to treat it is to make sure that you moisturize your skin several times a day. Moisturizing your skin throughout the day will help keep your skin moisturized if your skin is unable to retain moisture. There are several different products that you can use to help moisturize your skin such as creams, ointments, and lotions. This gives you many different options to choose from so that you can find the one that works the best. You will be able to treat the conditions caused by eczema once you find a moisturizing product. There are many people, me included, who enjoy taking long baths or showers, but this can worsen your eczema condition. A possible solution to prevent water from making your eczema symptoms worse is to take shorter baths or showers. You can do this by limiting your baths or showers to 10-15 minutes, which can lower your exposure to water. Hot water can make your irritated skin feel worse, so it is recommended that you use warm water for bathing. Limiting the time spent in water and using warm water instead of hot water are two possible solutions that can help reduce irritation of your skin. Below is a more in-depth look at these at-home remedies for eczema. The first product that should be considered is the Heyedrate Lid and Lash Cleanser. This is a product that can help with eczema and many other conditions such as dry eyes, blepharitis, itchy eyelids, dry skin, acne, and much more. There are a wide variety of conditions that this can help with, which makes it a useful product for many people. What allows it to reduce inflammation is its ability to kill microorganisms with a broad-spectrum microbial effect. Plus, it prevents biofilm from forming. This is what allows the Lid and Lash Cleanser to treat multiple conditions because it can lower your exposure to irritants. 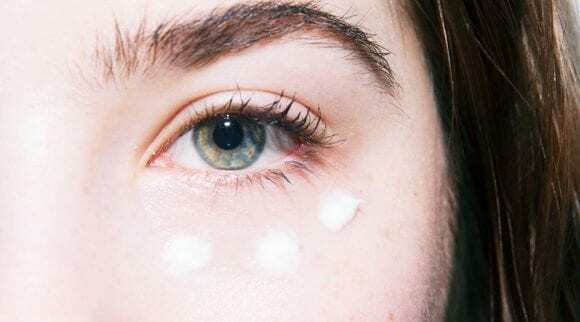 It is a natural product you can use to treat eczema around your eyes, so you can feel safe using it knowing there are no chemicals that will make your condition worse. It is natural because it is 100% organic, 100% vegan, alcohol free, fragrance free, preservative free, and it has no sulfates. This product is made with hypoallergenic diluted hypochlorous acid that will not irritate your skin. You can be confident it is a natural product for you to use and you will not need to worry about it containing anything that might irritate your skin more. You can use this product with ease by gently rubbing the spray into your skin and letting it dry on its own, so you do not need to rinse or remove it. It can also start working in a few minutes for fast relief of irritated skin. The simple process of using this product allows you to use it as part of your daily routine, which can help alleviate symptoms related to eczema. Symptoms that this product can help you get rid of are skin discomfort, dryness, and itchiness. This an affordable product that can be useful for alleviating eczema around your eyes. Another eczema around the eyes remedy is the Cortizone 10 Maximum Strength Ointment, which can help alleviate symptoms of eczema. It is a product that can relieve your skin so that you can be more comfortable throughout the day. This product is a maximum strength anti-itch ointment you can use to sooth your itchy or irritated skin. The ointment goes on your skin smoothly and it has aloe, which is what allows it to help sooth your skin. It is also a fast-acting ointment that gives you fast relief for your itchy skin. This product can help with different conditions that can cause itchy skin including bug bites, rashes, eczema, or psoriasis. Having the ability to relieve itchy skin related to these four conditions can make it a product worth purchasing. 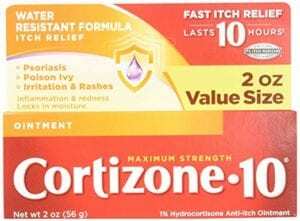 The Cortizone 10 Maximum Strength Ointment contains hydrocortisone, which is what allows it to relieve itching caused by minor skin irritation, inflammation, and rashes. It can help prevent you from scratching your irritated skin, which can help prevent you from developing scars or infections. It is an affordable option for you to choose that will help provide you with relief from eczema. Although this is not a natural remedy, it often works very well. Just take care to not get it into your eyes. Another product you can purchase that is a natural remedy is the Deep Therapy Cream Extra Care. This is a product that can help alleviate the symptoms of eczema so that you can be more comfortable. It helps the skin that is affected by eczema by providing moisture so that your skin does not get dry or itchy. One ingredient in this product is colloidal oatmeal, which has a high concentration of beta-glucan that keeps your skin moisturized and protected. This ingredient also reduces skin inflammation, provides an anti-itch effect, includes antioxidants, and can get immune cells working to heal your skin. The three hydrating oils that help moisturize your skin in this product are: jojoba seed, sunflower oil, and sweet oil. These oils also include nutrients and essential fatty acids that can also help keep your skin healthy. Having these hydrating oils gives this product an added benefit of providing more moisture for the skin affected by eczema. There are some more ingredients in the cream that provide even more benefits including chamomile, grapefruit seed, cucumber fruit, and coneflower. These four ingredients provide a few extra benefits such as protecting your skin from bacteria, protecting skin from viruses, and reducing inflammation. Also, it has beeswax that can help seal the moisture in your skin. Thus, helping your skin stay moisturized for longer. Beeswax is a natural sealant that creates a thin waxy layer to help keep moisture in your skin and prevent moisture from evaporating. This is another added benefit of this product that can make it a good option for any skin that is affected by eczema. The Deep Therapy Cream Extra Care comes with a 100% satisfaction guarantee, which means you can get a refund if it doesn’t work or if you are not satisfied with it. It is a quality and natural product that can help alleviate the symptoms of eczema. Using soap to wash your face is a good eczema around the eyes natural remedy, and DermaHarmony 2% Pyrithione Zinc Bar Soap is a good example. This is soap you can use to wash your face and it can help prevent eczema breakouts or alleviate the discomfort associated with eczema. It is made with 2% Pyrithione Zinc or ZNP, which is a mineral that can provide nutrients for your skin. You can safely use this product on your body and face, which means you can replace your current soap with it. Using this soap to clean your skin can help alleviate many discomforts include itching, redness, irritation, scaling, flaking, and dandruff. This product can be useful for people suffering from many conditions such as eczema, seborrheic dermatitis, psoriasis, acne, fungal conditions, etc. It can be a useful product to use that can help alleviate several different irritations and skin conditions. DermaHarmony 2% Pyrithione Zinc Bar Soap can be used on adults and children, which makes it safe to use for people of all ages. It is also a natural product that is fragrance free, made with no artificial colors, and made with natural oils. Plus, it is not tested on animals. Some of the ingredients include saponified oils, water, glycerin, titanium dioxide, oatmeal, olive oil, vitamin E, table salt, and salt of pentetic acid. It is a product that you can feel confident using knowing that it is natural and contains no chemicals that may cause your skin to feel even more irritated. You are supposed to use warm water with this product. Gently massage it into your irritated skin and keep it on your skin for 30 seconds before rinsing it off well. The simple directions on how to use this soap can make it convenient to use so that you can make it a part of your daily routine. You can also use this soap up to two or three times a day to maximize the relieving effects for your skin. This can be a useful product if you suffer from eczema and you’re looking for a way to alleviate your discomfort or prevent future outbreaks. 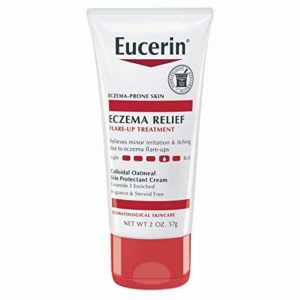 Another product that can be a good option for eczema is Eucerin Eczema Relief Flare-Up TreatMent. You can purchase this product if you are looking for a treatment that will help relieve your irritated skin. It contains a natural colloidal oatmeal that allows it to relieve dry, itchy, irritated skin caused by eczema. With this product, you would have a natural remedy for your eczema symptoms so that you may not need to use a strong medication. Being able to treat your eczema symptoms can help sooth your skin so that you can be more comfortable. Another feature of this product is a mild cooling sensation that allows it to instantly calm your skin that is affected by eczema. It is also a ceramide fortified formula that can help improve your skin condition by protecting, repairing, and enhancing your skin. An added benefit to Eucerin Eczema Relief Flare-Up TreatMent is its Licochalcone enriched formula that can sooth and improve the appearance of your red irritated skin. All of these details make it a useful product for you to purchase, which can help improve many effects of eczema. 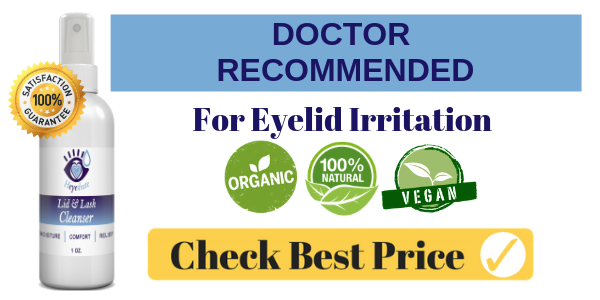 This option for treating eczema around your eyes is affordable and can give you relief. Calmoseptine Ointment is one product you can buy that is an eczema around eyes natural remedy. It has provided lots of people with some relief. You can use this product to help your skin affected by eczema so that you can be more comfortable. It temporarily relieves the discomfort and itching associated with eczema, which can help make your skin more comfortable. This product also provides a multipurpose moisture barrier that can help keep your skin moisturized and not dry. The multipurpose moisture barrier is an added benefit that allows this product to protect and heal your irritated skin. 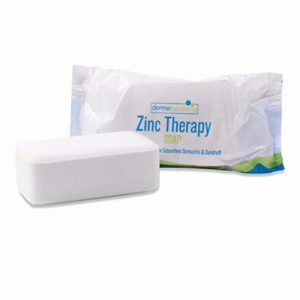 This product helps relieve pain and promotes healing, which makes it useful for eczema along with many other conditions. 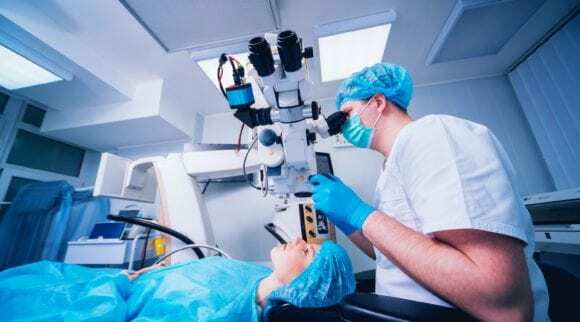 The different conditions can include minor burns, cuts, scrapes, dermatitis, hives, contact dermatitis, stage I pressure ulcers, and much more. Being able to use this product for many different conditions makes this a valuable product for you to purchase. It is a natural product you can purchase that can provide your skin some much needed relief. This can be an affordable option for you to choose that can be a simple solution to relieve your eczema symptoms. A product that you can use to help dry yourself off gently after washing your skin are the Kyapoo Baby Bamboo Washcloths. These washcloths are made to dry off skin affected by eczema, or other skin conditions. 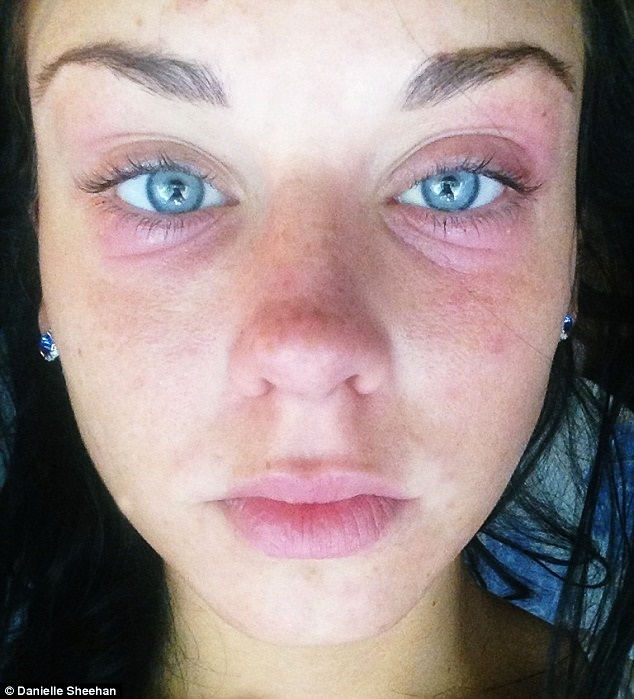 In addition, it can be a good eczema around eyes natural remedy. This product comes in either a five pack or 10 pack of bamboo baby washcloths that are durable, eco-friendly, and antibacterial. These washcloths are specifically designed for sensitive skin. They are soft and absorbent and comfortable to wipe even on sensitive skin. 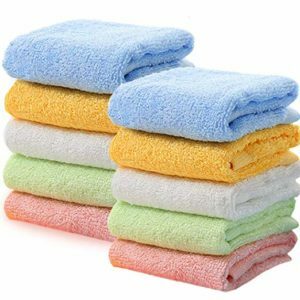 These soft washcloths are good for all types of sensitive skin including dry skin, psoriasis, eczema, and so forth. This product is designed to be used for babies, but it can be useful for adults who have sensitive skin caused by skin conditions such as eczema. So, what makes these washcloths natural? They are made out of 100% biodegradable, hypoallergenic, and super-absorbent bamboo fibers. You can feel comfortable purchasing these washcloths knowing that they are natural with no materials that will irritate your skin. It also comes with a 100% satisfaction guarantee and you can receive a refund up to 90 days after your purchase, which allows you to be confident purchasing this product. It can be a good product for you to purchase if you are looking for washcloths that can be used on sensitive skin. Another natural remedy is a product called Moisturizing Pure Coconut Oil Soap, which can be used to clean your sensitive skin. You can use this product on your face, hands, or body so that you can alleviate eczema symptoms on other parts of your body besides just your eyes. This product can be useful for sensitive skin because it is made with a formula that is anti-bacterial, anti-viral, and anti-fungal. The formula makes this a good soap to use for alleviating or preventing eczema symptoms. It has ingredients that are good for dry skin such as coconut oil, aloe juice, cocoa butter, colloidal oats, organic chamomile, and more. To use this product all you have to do is use fresh water, lather the soap, rub the soap onto your skin, and rinse it off your skin thoroughly. You can use this product and make it a part of your daily routine to maximize the positive effects it can have on your skin. 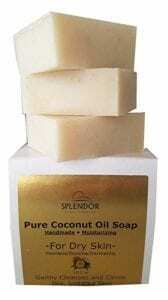 The coconut oil gives this soap a moisturizing effect that can restore dry or flaky skin and strengthen your skin tissue. 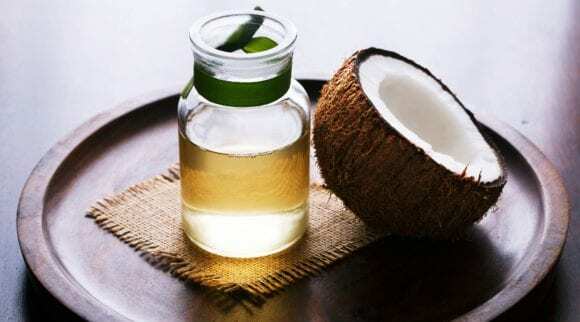 Coconut oil also contains three fatty acids to kill a fungal infection called candida, which can prevent discomfort. 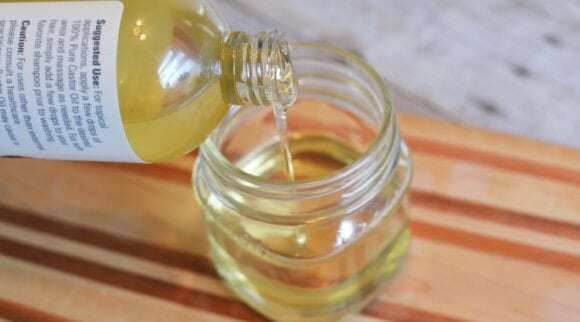 It also contains vitamin E that can help delay wrinkles and can help sooth irritated skin from a few conditions such as eczema, sunburns, and psoriasis. It contains pure aloe Vera juice that can help relieve or prevent inching, hydrate your skin, soften your skin, and sooth your skin. The organic calendula and chamomile provide skin with the protection of antioxidants that actively help improve the appearance of your skin. In addition, the colloidal oats provide gentle cleansing for your skin. Thus, making it a good soap to use on irritated skin. The coconut oil, calendula, chamomile, and aloe Vera juice all combine to make this soap a good product for eczema. With this soap, you can wash your eyelids and skin around your eyes to help alleviate or prevent your eczema symptoms. 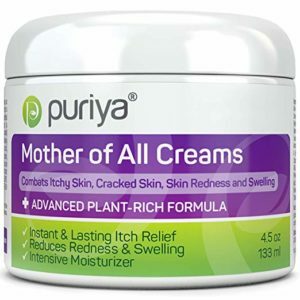 Puriya Mother of All Creams is another product you can buy that it is an eczema natural remedy. 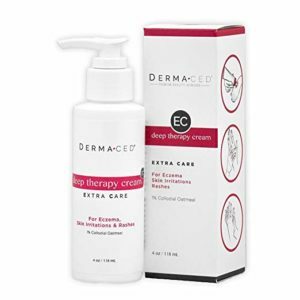 There are many benefits this cream has to offer when it comes to alleviating your eczema condition. The benefits include instant itch relief, long-lasting itch relief, reduced redness, and reduced swelling. It is an intensive moisturizer that spreads smoothly over skin and quickly absorbs. It can help your skin feel less itchy and look less red. This can help your skin feel less irritated so that you do not need to be uncomfortable. The symptoms of eczema that this product can provide instant relief for include dry, cracked, flaky, and itchy skin. It can hydrate and soften your skin, which can help strengthen the natural barrier of your skin that allows your skin to be repaired. The moisturizing effects of this cream leave behind no greasy residue. You can also use this product for other skin conditions besides eczema, such as psoriasis, rosacea, dermatitis, rashes, etc. All of the positive effects this product can provide make it a quality product that will have many uses for you. You can also feel confident that this product is natural because it is non-toxic and made with no artificial fragrances or colors. This allows you to know that it does not contain any chemicals that can make your skin more irritated. It also comes with a 180-day moneyback guarantee, which can allow you to feel comfortable purchasing this product knowing you can return it if you are not satisfied with it. This product is made with chamomile, peppermint oil, and tangerine oil but you should not use it if you are allergic to any of those ingredients. This product has many positive benefits that can make it a good option if you suffer from eczema. 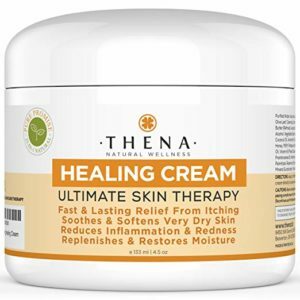 Another natural remedy that you can choose is THENA Natural Wellness Healing Cream, which can help alleviate your irritated skin. It is made from a natural plant-based formula that has concentrated nutrients, natural oils, and healing botanical essences. Key ingredients include Shea butter, organic coconut, jojoba, aloe Vera, olive leaf, calendula, comfrey, chamomile, vitamin A, and honey. These ingredients are designed to quickly go into your skin in order to repair and protect your skin and give you long-lasting relief. This is what allows this cream to prevent eczema flareups and infections that can cause your skin to feel further irritation. Having long-lasting relief and being able to prevent irritation can be useful for those who suffer from eczema. This healing cream serves as an anti-inflammatory with an anti-bacterial. Therefore, it can reduce the inflammation and discomfort that is caused by eczema. These positive benefits can allow you to feel relief from pain by targeting itchy, dry, scaly, red, and cracked skin. Other benefits of this product would be that it provides deep hydration, provides instant itch relief, it is fast absorbing, and it is non-greasy. Another benefit of this product is that it has no side effects because it is made with no perfume, colorants, irritants, mineral oil, or petroleum. With this product being natural and free of irritants you can be confident that it will provide you with relief from eczema. You can also use this healing cream for other conditions besides eczema such as psoriasis, dermatitis, heat rash, rosacea, hives, flaky skin, and much more. It is also made to be used for all skin types and it does not block your pores, which lets you use this product without worrying it will make your skin worse. You can also feel comfortable purchasing this product because it comes with a money back guarantee so that you can return it if you are not satisfied with it. You can have an all-natural quality healing cream that will provide you with relief from eczema with this product. Our final natural remedy option for you to choose is Ultimate Face and Body Cream by Honeyskin Organics. It contains ingredients that make it effective at combating pain and inflammation caused by eczema, which makes it a quality product. The ingredients that it is made with can also help soothe and rejuvenate your irritated skin cells, so you do not need to deal with discomfort. It is a deeply penetrating cream that absorbs fast to give you quick relief from the discomfort you feel from eczema. Symptoms that this product can help with include dry skin, itchy skin, oily skin, cracked skin, damaged skin, and sensitive skin. There are other conditions that it can help with besides eczema including acne, dermatitis, psoriasis, rosacea, shingles, sunspots, and much more. This product is also non-allergenic, unscented, non-greasy, and gentle so that you can feel comfortable using it for relieving eczema symptoms. It is a natural product that is made organically with no parabens, fragrances, or harsh chemicals that could make your condition worse. This also makes it safe to use for all skin types because it can provide relief without causing your skin to feel further irritation. It also contains other ingredients that can provide you with healthy skin such as vitamins, amino acids, and minerals that can help hydrate your skin. The Ultimate Face and Body Cream is a multi-purpose product that you can use on your eyes, face, and body. They recommend that you use this product along with super foods so that you can maximize the relief for your skin. You can also feel confident buying this product because it comes with a full money back guarantee. Therefore, you can return it if you are not satisfied. This is a quality product that you can purchase that can provide lasting relief from eczema. There are many people who suffer from eczema. Luckily, there are products out there made specifically to help alleviate the symptoms of eczema. Eczema can affect your skin on different parts of your body by making the skin irritated, itchy, and red. Your eyes are an area on your body that can be affected by eczema and there are products you can purchase to help with it. Finding a proper remedy can be important to treating or preventing the discomfort eczema causes. With this article, you are now aware of many different products that can help with eczema and you can choose the one that will work best for you.